You’ve most likely already heard about Pokémon GO, the new app that combines Pokémon with GPS, augmented reality, and physical exercise. It took only 13 hours to reach the top of the US iTunes list and is estimated to bring in about two million dollars a day. So why is this game so wildly successful and still growing rapidly? And how can this be applied to education? These are two questions that have been bugging this wannabe Pokémon Master since day one. For me, Pokémon GO’s first big sell was the nostalgia factor. I was seven years old when I got my first GameBoy and my first game was Pokémon Yellow. I would spend hours lounging around glued to my screen, trying to catch ‘em all. When I heard a new and improved version was releasing nearly 20 years later, I was chomping at the bit for the chance to relive my childhood. After numerous discussions with other similarly aged friends, they definitely were feeling the same way. Pokémon is not only popular with the twenty to thirty-something crowd, it’s also a trend in elementary through high school students. I constantly see my fourth grade students trading cards during lunch or sporting apparel branded with Pikachu. The appeal to a wide variety of age demographics is definitely a huge node of importance for Pokémon GO. The game is unlike other console Pokémon video games. On PlayStation, XBox, and the Wii, you remain stationary and watch what is happening on the screen in front of you. In Pokémon GO, the world is your screen, and the screen is a map of your world. The game forces you to get up, move around, and interact because Pokémon are dispersed throughout the real world. Real life landmarks are digitally marked as “Pokéstops” on your map. At Pokéstops you can gain items that help you in the game. This makes for a more active experience, and encourages physical activity rather than lethargic laying around. From my experience, Pokémon GO players also seem to be more friendly than in traditional videos games. I have had numerous conversations with other players, sharing tips and tricks, strategies, and challenges we’ve faced. That’s not something you’re likely to find in an online session of Call of Duty! 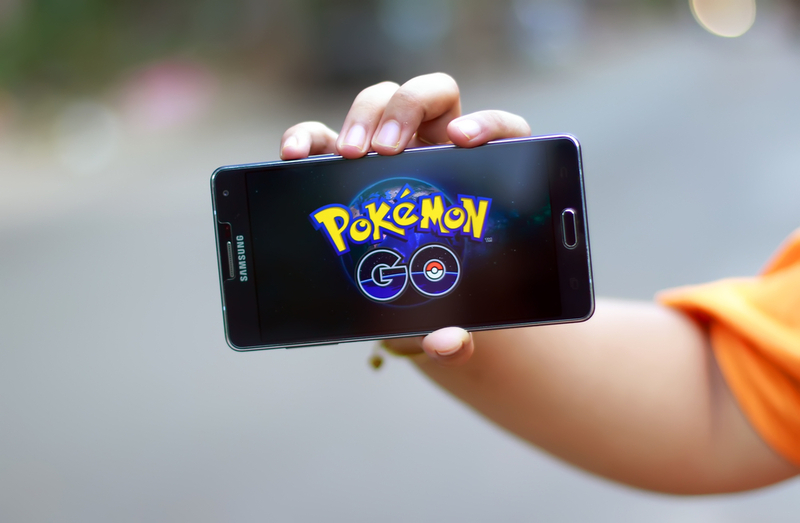 How can Pokémon GO be applied in education? The game itself can be used for numerous educational applications. As I mentioned, local landmarks are Pokéstops. Why not take students to these locations? When they are done filling up their virtual backpacks with items, ask them to fill their brains with inferences about the significance to the local history of that landmark. When you return to the classroom, this could spark a project-based learning activity on the history of your town. A great deal of Pokémon GO revolves around distance. Players must travel various distances to encounter Pokémon (indicated by a helpful footprint menu) or hatch eggs, and these distances are reported in meters and kilometers. This gives students something to relate to when you spark up a lesson on the metric system. Asking students to recall how far they had to travel to hatch an egg is much more engaging than showing them a meter stick. In the upper grades, Pokémon GO could be tied to physics and probability. There is a certain art to throwing Pokéballs at the various creatures, and it could lead to interesting lessons on parabolas, force, motion, and other physics lessons. Similarly, the rate at which Pokémon are captured is seemingly random… or is it? Students could research an expected probability of successful captures from old games, compare it to the actual probability in Pokémon GO, and see what variables affect it. Does the power of the Pokémon matter or is it the level of the trainer? These are questions that could spark passionate research. A moonshot goal for this game concept would be to modify the subject matter for what we need to be teaching. Instead of catching Pokémon, we could be interacting in historical battlefields or other historical locations through augmented reality. Imagine how engaging it would be for students to walk around Mt. Vernon and see George Washington in action, or watch General Patton give his speech on the shores of Normandy. Adapt elements from Pokémon Go such as gaining XP, adding these historical figures to a team, and storing items, and the creator of that educational app would be the very best… like no one ever was.